This is just one part of our saving in different stages of life series. For more, go ahead and read our tips on saving in your 30s, 40s, 50s, and 60s! Perhaps you’re still in college or are seeking some financial guidance now that you’ve graduated. It’s important to build good habits from an early age, so thinking about your future, even when you’re young, is crucial. Some of the issues you might face as you plan on saving in your 20s include facing student loan debt, living within your means, and beginning to build up an emergency fund. If you begin to make good financial choices now, future decisions will be easier! Many people in their 20s might not have considered the benefits of budgeting. Their parents may have provided money for them until now, or they might not have had any money to manage until now. 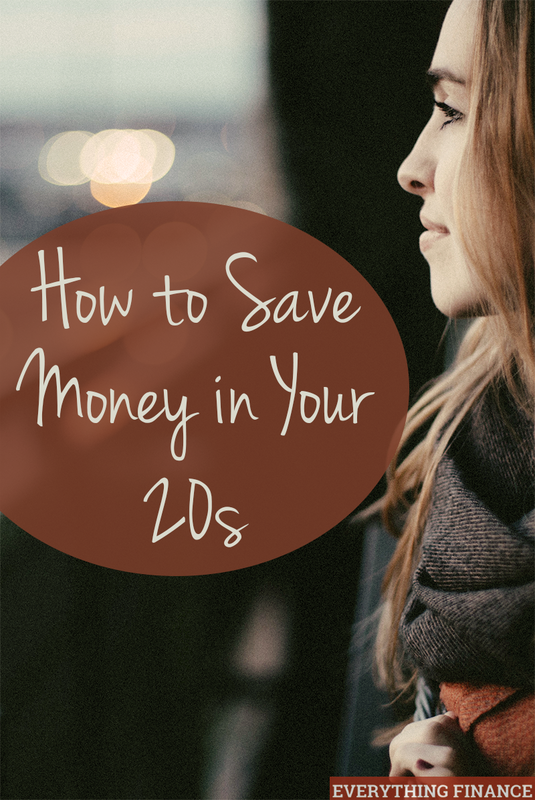 Either way, your 20s is a great time to take control of your finances. In theory, learning to budget is simple. First, you determine your income, which is the money you have coming in that is readily available. This may come from your regular job (if you’re working), or from other gigs you may have on the side, if you’re a student. Next, determine your expenses. Utility bills, debt payments, groceries, rent, insurance are all expenses to consider. While some costs may be out of your control, such as regular payments toward student loans or credit cards, you can better control your utility usage and food budget to give yourself enough money to put aside for savings. Need a few tools to make tracking your spending habits easier? While pen and paper are one way to determine your budget, Mint.com is a great site to use if you’re having trouble determining where your money is going. Just plug in your bank information and Mint does the rest, giving you easy access to categories for your budget and more! You can even set up goals in Mint to help save up money or pay off debt. Now that you have an idea of what your budget looks like, and how much money you’ll have left over, it’s time to think about saving. It’s a good idea to have an emergency fund, but it’s also a good idea to save up for your goals. You might want to purchase a new car or save for a payment down for a house. Are you having trouble saving up? Enroll in automatic deposit so you can put money away regularly. When the inevitable happens or you want to make a change towards your long-term savings goals, you can simply adjust your automatic deposit. How much should you have in emergency savings? While most financial experts believe 3 to 6 months’ worth of income is ideal, when you’re younger, you might not need as much. Instead, save around 1-2 months of income, and devote your funds to other necessary expenses, such as paying off debt. Speaking of paying off debt – if you’re in your 20s, you likely have some type of educational debt. It’s important at this stage of your life to consider tackling your debt payments sooner rather than later. Even small payments while you’re in college can add up to big savings when loans come due. Students have two options when it comes to student loans: they can apply for private loans, or federal loans. Each comes with its own sets of rules and regulations. It’s important to know the difference before signing your promissory notes, which are agreements with the institutions to pay off your debt. Private loans are financed by banks or larger financial institutions. With private loans, it’s important to consider if you want a fixed rate or variable rate loan. A fixed rate, as the name implies, does not vary with the market. The rate you get initially is the rate you lock in for the life of the loan. A variable rate can go up or down with the market, which can increase or decrease the interest rate on your loans. Private loans don’t come with as many options as federal loans when it comes to helping you pay off your loans. Select lenders are offering forbearance and refinance options, showing that they’re willing to work with borrowers. Forbearance allows you to delay making a payment on your loan for a set period of time, although the interest continues to build during that time period. Refinancing can help make your loans more affordable, as you can possibly lower your interest rate or extend the term of your loan, resulting in lower payment amounts. At the very least, your best bet is to call your lender and ask if they’ll be willing to work with you. If you have a good track record, that will make them more likely to be able to help you. When you fill out the Free Application for Federal Student Aid (FAFSA), you provide the Department of Education with information that determines your eligibility for federal student loans. The FAFSA can also determine your eligibility for the Pell Grant and other funding options for your education. Fixed, low interest rates – According to the Department of Education, private loans can have variable rates that go as high as 18%, where federal loans do not carry that risk. Deferment of loans – Similar to forbearance, deferment allows you to stop making payments on your loan for a set period of time. However, interest doesn’t continue accruing during this time. Possible eligibility for a subsidized loan – During the time you’re in school (even if you’re attending part-time), the government will pay the interest on your subsidized loan. Interest may be tax deductible – The interest you pay on private loans may not be tax deductible. Several repayment options – Federal loans offer flexible repayment programs in the event you’re having difficulty making payments on the standard 10 year plan. Even with fixed interest rates, deferment, forbearance, and refinancing as options to help you manage your loans, it’s easy to feel overwhelmed about paying them off. Consolidation – Do you have a number of smaller student loans to manage? Consolidating them to get a lower rate is a good way to lower your payments and reduce the number of payments you need to keep track of each month. Make extra payments – If you have the means to do so, pay extra on your student loans to pay them off quicker. A small amount can also help you pay less over the life of the loan. Choose a repayment strategy – Do you want to pay off your lower balances to get a quick win, or does paying off higher interest loans first matter more to you? Choosing how to conquer your debt can be as important as determining what payment plan you’ll follow, but don’t be afraid to change your plan midway if it’s not working out. For example, you may want to pay off a small loan first for a boost of confidence, then attack your high interest debt aggressively. When you begin a new job, or are on your own in college, it can be tempting to splurge on a new car, rent an expensive apartment, or buy new clothes to celebrate your achievements. However, it’s important to make wise financial decisions now so you can have a successful future later. Here are some tips that will help you live within your means when you’re young and give you a leg-up on your finances. Live Modestly – It’s better at this stage in your life to choose housing that’s within your budget. Living with a roommate is a great way to cut costs. Plus, you can expand your social circle and meet their friends, too! Don’t Rely on Credit – It might be tempting to sign up for a credit card when you start college, but living off of it is a good way to put yourself in financial trouble. If you do use a credit card, be sure to pay it off in full each month to avoid racking up interest. However, the best way to avoid accumulating consumer debt is to avoid acquiring it in the first place. If you can’t trust yourself with credit, choose cash or your debit card. Learn to Cook – Is your food budget out of control? Cut back quickly by picking up cookbooks and trying some recipes at home. You may find that cooking is not only relaxing, but tastes better than eating at restaurants or ordering food for delivery. Choose Affordable Entertainment Options – Although it might be easy to give into peer pressure to go to concerts or go on pricey vacations, the expenses can add up quickly. Attend free events on campus to help you cut down on costs. Research fun and free entertainment options you and your friends or family can enjoy together. Although you’re young, you can make good financial decisions today that will pay off in the future. Getting your debt paid down, building an emergency savings, and making good financial habits part of your everyday money strategy will help you be financially fit for the rest of your life.